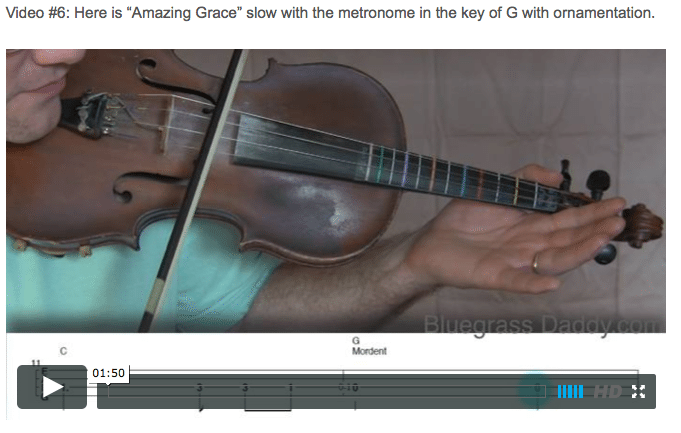 This is an online fiddle lesson for the tune "Amazing Grace." This topic contains 26 replies, has 9 voices, and was last updated by John Cockman 4 years ago. Probably the most sung gospel song ever and the one that always makes my mother-in-law cry. Thank you so much for your lessons! 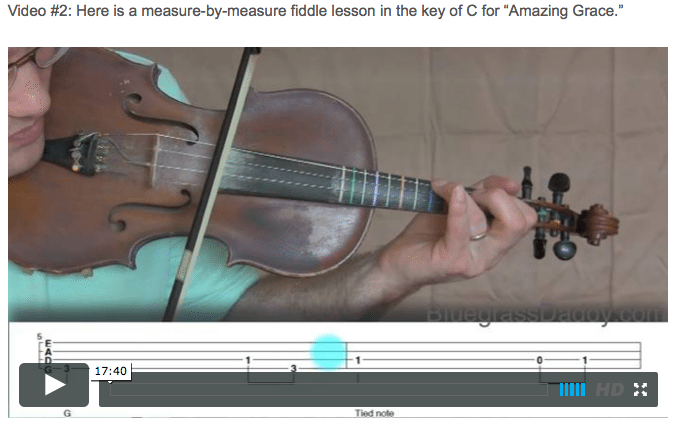 This is the first site I have found where I actually understand what is being played and also how to read violin tab. I plan on joining. My question..Are there more lessons than what I am seeing on here or is this just a donation for the work you do? Seriously I am completely fine either way and was just curious. My son has been taking fiddle lessons for about a year and a half now. Going to sign up so we can have access to your lessons! I am sure he can learn much from you, but just having access to the mp3 accompaniment tracks is worth the price of admission. Thank you! Please spread the word! I am sorry to hear about your grand nephew. God bless his family. Since when does the Key of C have sharps in it? I thought it went CDEFGAB. I noticed that the notation tab for Amazing Grace (Key of C) has a sharp(#) set just after the treble clef (amazingC_notes.pdf). Is that supposed to be there? Or am I reading it wrong? Great questions Charly. I originally put this song in ‘G’, which has an ‘F#’ in the scale, and then transposed it to ‘C’ without changing the key signature. I guess it isn’t optimal, but it works OK because there is no ‘F’ note in the entire song. So, it is kind of a red herring. If there were an ‘F’ note somewhere, the notation would have to show a “natural” sign beside of it, to negate the demands of the ‘G’ scale. So, if there were more than a few ‘F’s in the song, it would have begun to look cluttered with naturals, and so I would have changed the key signature to ‘C’. I can see how this can be bothersome, though. I will change the key signature to remove the ‘F#’ and upload the file. Well…at least I’m learning something! Thanks John for being my teacher! Perfect or not, you are doing an AWESOME job! Kudos, my friend! In the ornamentation for Amazing Grace, I saw these notes – a triplet that ends on E, and a pull-off from E to G. I don’t understand what the difference is between a normal finger change from E to G, and the shown pull-off from E to G. How can it be a pull-off if you’re going there anyway? I’m wondering if a pull-off actually involves a slide down with the finger, rather than just a lift. (Of course then I wonder, by symmetry, if a hammer-on also involves a slide, which I don’t think it always does.) So is this pull-off really a “pull-off with slide” or something like that? I’m having problems embedding an image, and I tried to attach it and that also failed (sigh). Don’t really know what to do now. The pull off is in bar 4 of the ornamented G tabs, if you want to look at it, just after the triplet E-G-E.
A pull-off is not a slide. Technically a pull-off occurs whenever you lift your finger to expose a lower finger or open note during the same bow pull. In this particular song, I am highlighting several types of gracings. The difference between this grace pull-off and a regular pull-off is that the grace pull-off is performed quickly and with no timing indicated. It is just a quick lift as you enter the note. Hi John, thanks for your words about pull offs. But… sorry to say that they didn’t really answer my question. My finger is already on the E note, and would already normally lift to get the D note. So is the grace note pull off telling me something special about how I should lift my finger off (other than normally)? I’m thinking maybe the grace pull off is telling me NOT to lift my finger off normally. Instead, leave it on the E, sound a second (grace) E note before the D, and then pull off to hear the D? John might answer this more or differently. But, since I just saw this, I thought I’d give my 2 cents (which may not even be worth that much). The key is in the bow. A regular change from 1st finger e to open d would happen WITH the bow change. So you hear e (with one bow) then d (with the next bow). But when you play the pull off, you are playing the e…keep your finger down, change bow, and pull the e off to expose the d. That little split second e when the bow changes is the difference. That is right, Angela, it is a quick little E just before the D, that happens just at the change of the bow direction. Keven, you are right also. There are two E notes being played, back-to-back. The second E is the grace E, and is very short in length. It is a different bow direction from the E that ends the previous measure. Thanks to both of you for clearing that up. Now for the next question for John, could you please say a few words on why you picked that particular note for the grace note? Especially since there was a triplet roll right before it? 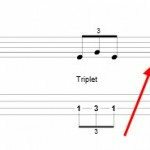 I’m looking for a convention or rule of thumb, like “Whenever you get a long note after a triplet, it’s always a good place for a grace note because…?” I’m hoping you didn’t just pick the D note at random to put a grace note on it. Hi Kevin, the grace notes are there for flavor and variety, but you don’t want to over-do it. Although you could grace every single note in the song, it would be so busy, no one would enjoy it. So you kind of have to pick and choose. That is why I only have one or two gracings per line. The question is, which ones should I use? The only rule I can give you is not to use them so often that it becomes annoying. One cool thing about gracings is the sheer multitude of possibilities available. I can play Amazing Grace three times through, but with slightly different gracings each time, and the listener’s ear doesn’t get as tired out as if I did it with no variation. I’m going to give you a few examples in my follow-up posting. 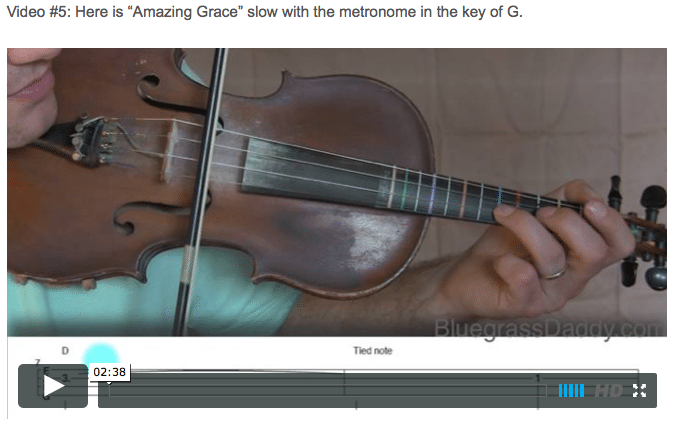 Hi John, thank you for taking the time to make the video above on grace notes. I really don’t want to seem dumb as a student, or to be a pain (you know me well enough already to know that, I’m sure), but… I’m sorry to say that once again you didn’t really answer my question about a general policy or strategy for placing grace notes. To be honest, random placing is _exactly_ what I’m trying to avoid. I want to believe that there’s a better strategy than random for improving my playing and ornamentation. I want to believe that you — as teacher and pro bluegrass player — also have a “better than random” strategy for ornamenting a song. (1) The video was zoomed in more than normal, so I could really see your fingers on the finger board. Along with the slow pace of the song, it was a superb view of your fingers, moving slowly enough so that I could see (and hear) what was happening. For my two bits, it’s an excellent way to show finger work like this. (Maybe the measure by measure lessons with top view camera also show similar finger work, but I confess that I’ve never watched one of those). (2) The playing technique that really, really jumped out to me was your third finger slides on the D string – a few times you hit the G note, slid down to F#, and immediately slid back up to G. I’ve heard that kind of thing before in your playing, and have always wondered how you made that sound, and now I know — I’ll have to try it as soon as possible. To me, the main sound that almost defines bluesy bluegrass is the use of slides, so I was glad to see how you did those slides. (If you have a pile of those kind of slide techniques, another close up video would be appreciated by everyone, I’m sure.) Double stops (actually, drones) are the other really Cajun/Bluegrass characteristic sound (or so I think). 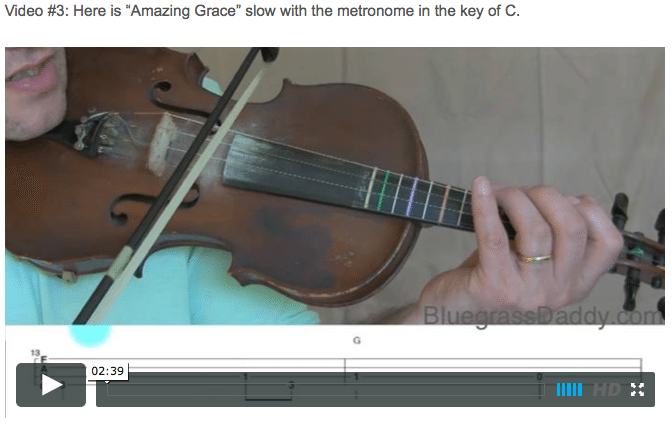 Grace notes, trills, rolls, etc seem far less important / characteristic of bluegrass sound (at least to me). (1) You can randomly place grace notes. 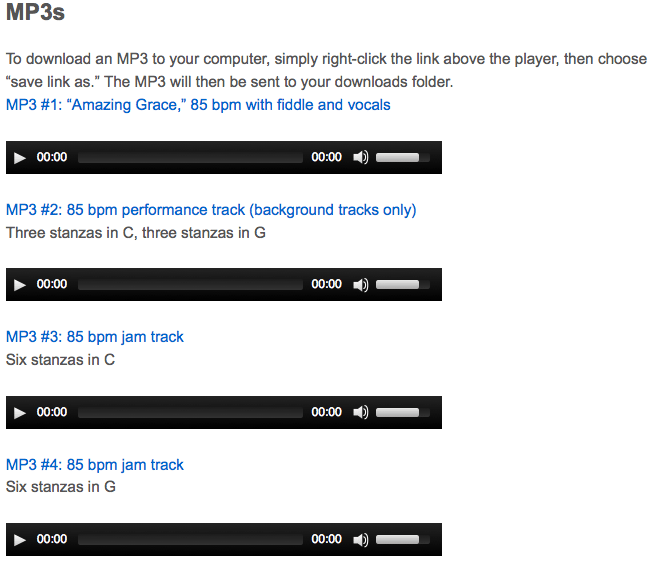 (2) If you use too many (2a) it can be bad (2b) because they can make the song unrecognizable. (3) You can place them around long bows, or short bows, or … randomly… and they can sound good. All those things are true, of course – I can randomly toss in grace notes, at random locations, and as long as I don’t toss in too many, it “can” randomly sound good. But I really don’t want to be random. I want to be better and more efficient than that. For example, there are a LOT of random places to put grace notes, and a LOT of time I would have to spend placing them, listening to them, comparing them, and then finally picking a few locations that I thought sounded best. That’s what we in the software field would call a “brute force” algorithm — place 1 grace note at a time in all possible song locations, then place 2 grace notes into the song in all possible 2-position combinations (like “N choose 2” in mathematical speak), then compare and pick the ones that you like, repeat for 3 grace notes and combinations, etc… LOTS of work. Not random by any means, but thorough. OK this went longer than I meant it to. 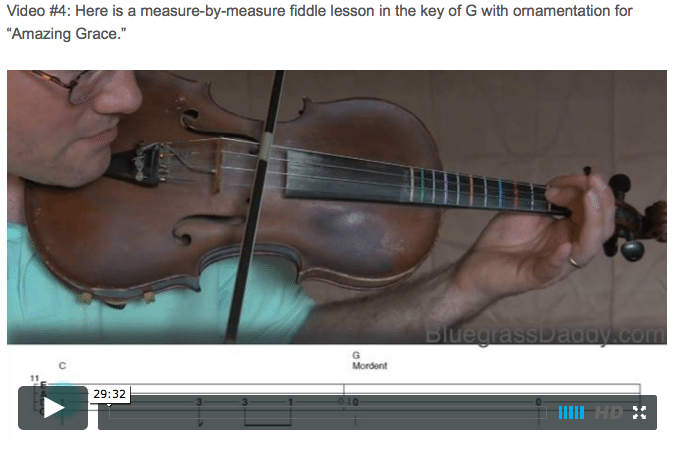 I am using this video as practice for creating lessons on ornamentation placement. John, what does mortent mean? Bruce, a mordant is a short note in the middle of the main note, which is usually lower than the main note. If the short note is higher than the main note, it is usually called an upper-mordant, or a turn, or a cut.